As we reach the snowy end of an exciting year for the laboratory, I thought I would take some time to write our first laboratory ‘Annual Review’ as a summary of the year’s activity. Richard Crossland joined the laboratory in October. Richard originally studied Biology at Newcastle, and joined us after successfully completing an MSc in Bioinformatics and Computational Systems Biology, also at Newcastle. Richard will be working with myself and Jon Hobman building mathematical models for metal responses in E. coli. We are starting with response to mercury, and plan to move on to other metals, with an interest in using models to help explain how the chemistry of different metal ions drives the evolved biology. We plan to use ODE, stochastic and multi-scale modelling approaches during Richard’s PhD. Ewan Johnstone worked with us as an undergraduate researcher for 10 weeks over the summer. Ewan was looking at analysis of Biolog data generated from both yeast data on the LACE project in collaboration with Katherine Smart and E. coli data with Jon Hobman, specifically identifying good models for fitting such data. Ewan’s results are very promising, and we are now pursuing potential avenues for further funding of this work. Isma Hj Ismail worked with us for her MSc project as part of her MSc in Integrative Systems Biology. Isma was looking at analysis of luminescence data associated with B. subtilis spore killing by antimicrobial agents, in collaboration with Phil Hill. With this data, we showed that simple models worked best, but that pre-processing and normalization were essential to derive reliable results. As the year ends, we will be saying good bye to Rafik Salama, who is due to submit his PhD on 23rd December. Rafik has been a big part of the lab for the last three years: in addition to his excellent research, he has helped with summer project supervision, undergraduate tutorials and developing collaborations. We have one paper already published from Rafik’s thesis (see below), and intend to work on two more over the coming months. Rafik will be starting work as a postdoctoral research fellow in Masashi Arita’s laboratory at the Cancer Research UK Cambridge Research Institute. We wish Rafik and his family all the very best for the future! We have published five papers in 2010, three of which are works entirely from the laboratory. We have produced a web site for this method, where you can apply it using any binding site sequences to any bacterial genome: it is available at http://www.ulpb.bham.ac.uk. We have since made further improvements to the methods and we are currently preparing a new publication describing these. Two papers have been published from Dafyd Jenkins’s PhD, Journal of Molecular Evolution, 70: 215-231 and Journal of Molecular Evolution, 71: 128-40. Both of these works investigate the evolution of gene regulatory networks using artificial life techniques, attempting to make the models sufficiently realistic to be of biological relevance, while sufficiently fast to enable simulation of long-term evolution. In the second work, we apply the paradigms to evolving gene regulatory networks in different simple and complex environments. We obtained the remarkable result that overlapping, hierarchical, global and local regulators evolved in complex environments, but not in simple environments. So far as we are aware, this is the first time anyone has observed the evolution of global regulation, and, in our view, clearly demonstrates that global regulation is an adaptive response, rather than a non-adaptive by-product of the way DNA replicates. These papers complete the publication of work from Dafyd’s PhD, and we are now considering options for further funding to continue work in this area. In collaborative work with Peter Gasson at the Jodrell Laboratory, Kew Gardens, together with University of Birmingham placement student Frances Whinder, we helped develop statistical techniques for identification of endangered Brazilian Rosewood. The international trade in Brazilian Rosewood (Dalbergia nigra) timber is regulated by its inclusion on CITES appendix 1. 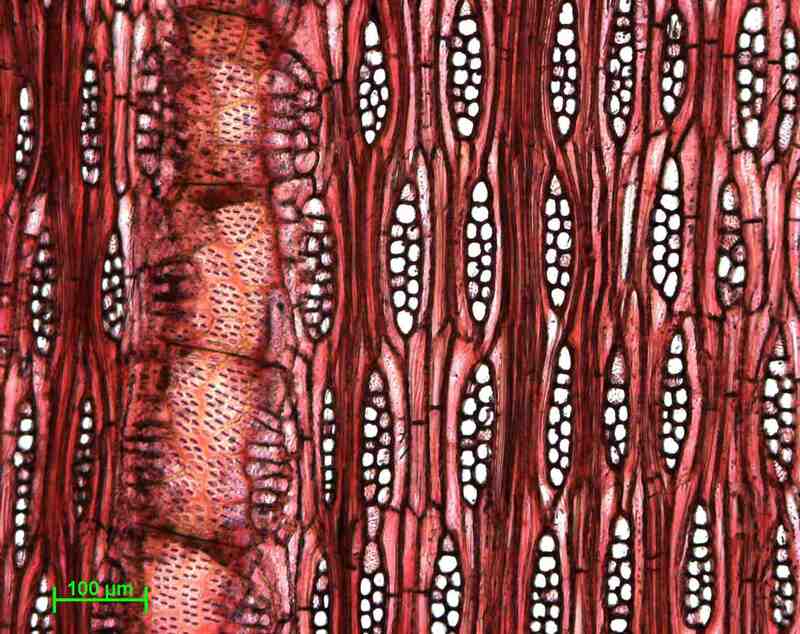 Enforcement requires precise identification to species, and in Annals of botany, 105: 45-56 we describe a new method using quantitative wood anatomy that can reliably separate this species from six other New World Dalbergia species, with which it can easily be confused. Dalbergia miscolobium image thanks to Peter Gasson. We used a Naive Bayes approach to separate out the species based on different distributions for different characters. This simple parametric approach has wide application in many classification problems and we anticipate using it in more molecular studies to come. 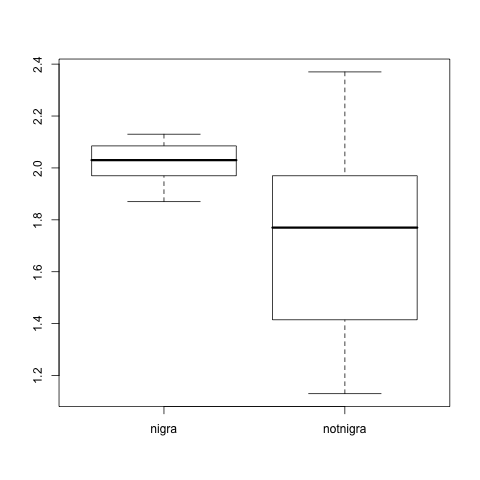 Distributions of mean ray width from Dalbergia nigra and other Dalbergia species, showing that the probability density from normal distributions fitted to each sample can give a partial separation between the two classes. By combining similar distributions from other characters, we were able to achieve good classification results. Our first publication of the year, Pacific Symposium on Biocomputing, 477-80, was put together by Chrisantha Fernando and Richard Goldstein, includes our thoughts on the use of in silico biology (see for example Dafyd’s work above). This work was presented at a workshop at the PSB, but unfortunately I was not able to attend. Members of the lab have presented posters at a number of conferences. Rafik Salama and Dorota Herman both presented posters at the 9th European Conference on Computational Biology in Ghent: Rafik on his work on transcription factor binding site prediction, and Dorota on her work on modeling global regulation in RK2 plasmids. Dorota also presented her poster at the 11th International Conference on Systems Biology in Edinburgh. 2010 has been a good year for research funding, with the laboratory receiving significant support from the BBSRC, as well as support from the e-Science Institute. Richard Crossland is funded on a four-year BBSRC DTA studentship, administered by the School of Biosciences. Ewan Johnstone’s summer placement was funded by a BBSRC Systems Biology initiative. We were delighted to receive funding from the e-Science Institute to run Theme 14: Modeling and Microbiology; this theme is led by Rosalind Allen and is in collaboration also with Jamie Wood. The theme is currently running: we held our launch event, a workshop on stochasticity in infection, during September, at which Ros gave the opening public lecture. In 2011, we are planning three further events, a workshop on evolution in January, a workshop on metabolism in April, and a research conference in the week starting 4th July. Ros has already lined up an excellent programme of international speakers for the conference, and conference and registration details will be posted once they are publicly available. The awarding of a BBSRC / JST Japan Partnering Award has been a real boon for the laboratory. This is a collaboration with Jon Hobman (Nottingham), Naotake Ogasawara, Shigehiko Kanaya, Taku Oshima, Hiroki Takahashi (all from the Nara Institute of Science and Technology) and Toru Tobe (Osaka University). We are looking at systems biology analysis of response of pathogenic E. coli strains to metals. The grant has already funded research visits of Naotake, Shigehiko, Taku and Hiroki to the UK in June this year and a visit of Jon Hobman and myself to Japan in November this year. We have now defined a clear programme of work and further research visits both to Japan and to the UK are planned for 2011. More details will be posted. The largest research award has been the BBSRC funded grant for studying the Lux promoter fusion transcription read-out system, in collaboration with Phil Hill and David Scott. This exciting project includes funding for two postdoctoral research fellows, one experimental who will work with Phil and Dave, and the other theoretical, who will be working in my laboratory. The modelling post is currently being advertised, so click here for further information. The grant will start in April 2011 and will become an important activity over the coming years. We hope you have found the laboratory review helpful and useful and wish you a happy Christmas and New Year. Based on our Sutton Bonington Campus, this post is available from 4th April 2011, or as soon as possible thereafter and will be offered on a fixed-term contract for a period of 33 months. Applications are invited for the above post to join a highly motivated multi-disciplinary team of research scientists working at the University of Nottingham. The successful candidate will join a BBSRC-funded project using synthetic biology/modelling approach to improve bioluminescent reporting, molecular characterisation and exploitation of bacterial cell-to-cell communication as an antibacterial target. Long-term impacts include aiding the development of novel antibiotics targeted against important diseases such as MRSA, and the reduction in the use of animal experimentation. Details of the objectives of the grant (lay and technical summaries) can be read on http://wp.me/pVP7y-1P. The work will include: developing mathematical models using ordinary differential equations; developing statistical inference schemes and software embedding the mathematical models (using Monte Carlo Markov Chain and/or other appropriate techniques); applying the methods to experimentally derived data; disseminating the software through appropriate open-source channels for general use. Other duties will include publication of this research in peer-reviewed journals and presentations at national and international conferences. Candidates must have a PhD (or be awarded before or within the first six months of the employment start date) in mathematical modelling or statistics or systems biology or a related area. Research experience within a mathematical biology or biostatistics research area would be desriable but not essential. They must to be able to demonstrate excellent mathematical ability, especially in the areas of ordinary differential equations and probability; experience of application of these skills to biological research would be desirable. Candidates must also be able to evidence good computer programming skills in a suitable high level language (e.g. C++ or Java) and/or a statistical programming language (e.g. R). Excellent English language oral and written communication skills are also essential. This post will require the person appointed to be able to work independently and as part of a multi-disciplinary team, to be motivated, flexible and willing to learn. Informal enquiries may be addressed to Dr D Stekel, Email: dov.stekel@nottingham.ac.uk. Please note that applications sent directly to this Email address will not be accepted. To apply for this position, please follow the link from the University of Nottingham vacancies web site at http://www.nottingham.ac.uk/jobs/currentvacancies/ref/SCI921.